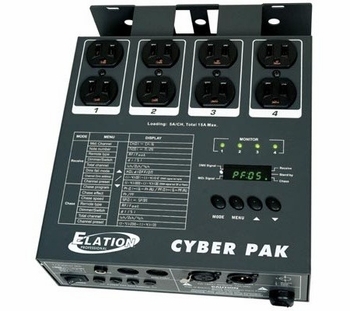 Elation Cyber Pak 4-Channel Dimmer / Power Pack DJParts - All Variety of Parts that DJ Needs. The CyberPak is an All in 1 Dimmer/Power Pack with Multiple functions for almost all of your needs. This pack allows you to convert from a dimmer to a relay pack through the menu function. The Cyber Pak has the function of 4 paks in 1.